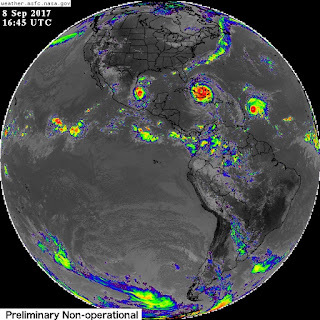 Infrared images of Hurricane Katia in the Gulf of Mexico, Hurricane Irma (over Cuba), and Hurricane Jose (near Leeward Islands) in the Atlantic Ocean. Certainly a busy day for weather forecasters. Images from the GOES 16 weather satellite of the National Oceanic and Atmospheric Administration (NOAA).